What do facial expressions and body languages say to you? Images provide great opportunities to promote critical thinking. These critical thinking worksheets have children predicting, inferring, analyzing, using point of view and constructing meaning. 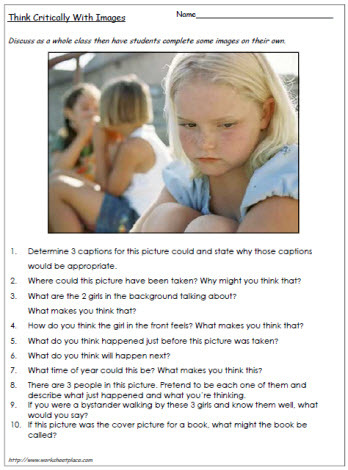 The image used in theis worksheet also focus on issues of bullying. Using worksheets like this one are great activities to stimulate higher level thinking. There is no text in the pictures, therefore students need to construct their own meaning by using picture cues.